Palmia in Mission Viejo, California is a gated community that welcomes active adults aged 55 or better. This beautiful guard-gated community features many amenities that appeal to active adults. Just a few of the community's highlights include a 12,500 square-foot clubhouse, an 18-hole putting green, resort-style swimming pool, tennis courts and multiple hobby and game rooms. Southern California's surrounding area contains many shopping, dining, and recreational attractions. There are several nearby public golf courses, and the beautiful Lake Mission Viejo, a community lake that provides swimming, boating and fishing recreations. Convenient access to Route 5 makes it easy for Palmia residents to explore the surrounding area, including Los Angeles, which is only an hour northwest of the community. Activities at Palmia are centered on the community's 12,000 square-foot Club Palmia. Here residents can enjoy card rooms, a billiards room and explore a new hobby in the arts and crafts or ceramics studios. The hobby and game rooms are ideal for both impromptu get-togethers and planned meetings for the community's many social clubs. Club Palmia offers residents a library for finding a new great book. To help residents stay in top shape, Club Palmia has a fitness center complete with cardiovascular and strength-training equipment. Just outside Palmia's spacious clubhouse, residents can make use of the resort-style swimming pool and spa area, shuffleboard court, bocce ball courts, and an 18-hole putting course. Palmia's tennis facilities include two regulation tennis courts and two pickleball courts. Residents of Palmia Courts also have two private outdoor pools and spas. Set on 211 acres, Palmia features 901 thoughtfully-designed homes divided into five different areas: Palmia Heights, Palmia Vistas, Palmia Villas, Terraces and Courts. One- and two-story detached single-family homes can be found in four of these sections. One section, The Courts, offer one and two-story attached homes. Homes throughout Palmia were built by the Mission Viejo Company, and are available in a range of styles and sizes on a resale-only basis. The single-family homes range in size from 1,162 to 2,473 square feet and offer one to four bedrooms, two to three-and-a-half bathrooms, and an attached two-car garage. Palmia Courts has seven attached home plans. These units offer approximately 1,000 to nearly 1,800 square feet of living space with two to three bedrooms, two or two-and-a-half bathrooms and an attached one or two-car garage. Many plans include family rooms and some offer additional features such as a den or cathedral ceilings. The many social clubs at Palmia are sure to spark the interests of new residents. Clubs cover activities such as golf, bocce ball and shuffleboard. Those inclined to the arts may choose to join such groups as the Opera Club, Chorale Club or Palmia Players Club. Palmia residents looking for a new exercise routine can try their hand at water aerobics, softball, pickleball. Special interest groups include the genealogy group, the wine club, and the literary group. From gardening to ceramics to movie night, there is something for everyone at Palmia. To make it even easier to live life to the fullest, a full-time activities director is on hand to help coordinate community events, organize social clubs, and plan excursions. The active lifestyle at Palmia also continues outside the community gates, as the surrounding area has several attractions. Golf enthusiasts will be glad to learn that there are several great public courses nearby including Casta del Sol, Tijeras Creek, San Juan Hills Golf Course, and the Arroyo Trabuco Golf Club. Residents also have membership to Lake Mission Viejo where they can enjoy a day on their boat, fishing from the beach, or relaxing with family and neighbors in the picnic areas. The lovely Palmia community is situated within the beautiful area of Mission Viejo, just south of Irvine. There is plenty to do just outside Palmia's gates. Nearby Portola Plaza contains a supermarket, restaurants, shops and other conveniences, while the Laguna Hills Mall is only fifteen minutes away. Convenient access to major roadways, such as Route 5, makes it easy to visit nearby Irvine, Santa Ana, and Anaheim. Los Angeles, and all the city has to offer, is about an hour's drive northwest of Palmia while San Diego is about 80 miles to the south. With close proximity to major cities, beautiful beaches and scenic drives, Palmia in Mission Viejo, California offers residents resort-style living in a beautiful year-round climate. All residents enjoy access to the Palmia clubhouse with its assortment of indoor and outdoor amenities. Club Palmia - 12,000 Sq. Ft. In addition to Club Palmia's amenities, residents of Palmia Courts have access to two private pools and spas. 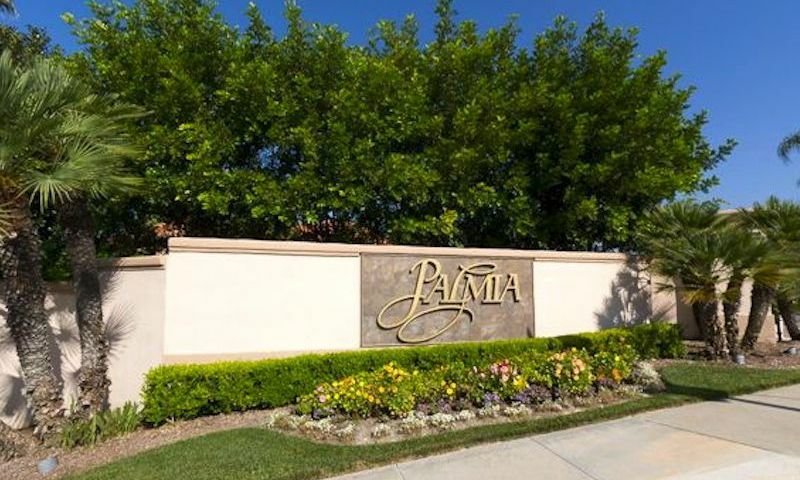 Residents of Palmia automatically have membership to Lake Mission Viejo that is less than two miles away. There are plenty of activities available in Palmia. Here is a sample of some of the clubs, activities and classes offered here. The Palmia Courts provide an ideal carefree lifestyle with all home maintenance included with the association fee. These attached homes are offered in one and two-story designs. These units range in size from approximately 1,000 to over 1,700 square feet and offer two to three bedrooms, two or two-and-a-half bathrooms, and an attached one or two-car garage. Residents of the Courts also enjoy two private pools. The Palmia Villas are available in nine single-family designs ranging from 1,162 to 2,283 square feet. The Villas are located in two neighborhoods: Villas 1 and Villas 2. The Villas feature two to three bedrooms, two to three bathrooms, and an attached two-car garage. The Palmia Vistas are appealing single-family homes at a managable size. These single-level homes have one to three bedrooms, two or two-and-a-half bathrooms, an attached two-car garage. Homes range in size from 1,401 to 1,826 square feet. The Palmia Terraces are ideal for residents who want the ultimate in luxury and comfort. These elegant and spacious homes are available from 1,510 to 2,188 square feet and have two to three bedrooms, two to three bathrooms, and an attached two-car garage. Some plans offer second floors and vaulted ceilings. Palmia Heights offers luxurious one and two-level single-family homes. There are six plans to choose from ranging from 1,756 to 2,473 square feet and have two to four bedrooms, two or two-and-a-half bathrooms and an attached two-car garage. Our home at Palmia has been wonderful. The community is private and gated with tons of nice amenities. Everything is well cared for and the people here are very friendly. We love the location and have been nothing but pleased with our decision to enjoy retirement here! 55places.com is not affiliated with the developer(s) or homeowners association of Palmia. The information you submit is distributed to a 55places.com Partner Agent, who is a licensed real estate agent. The information regarding Palmia has not been verified or approved by the developer or homeowners association. Please verify all information prior to purchasing. 55places.com is not responsible for any errors regarding the information displayed on this website.